I wanted to share some photos of some more old projects that I had created. 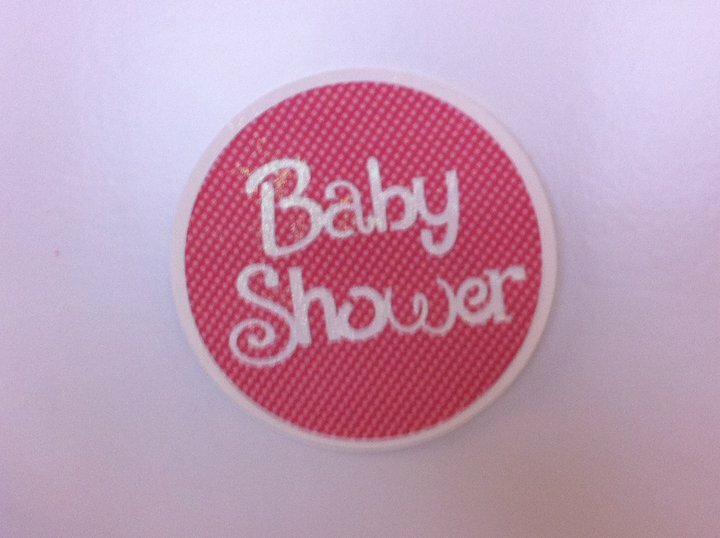 These were used for a variety of different baby showers that were thrown at my work for my friends/colleagues. In these projects, I used the New Arrival Cricut Cartridge. 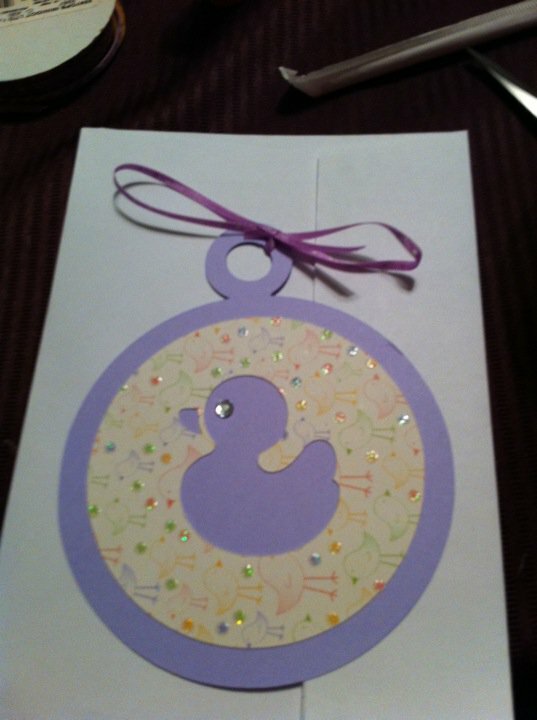 I can’t seem to find all the pictures (boo) but I used the Duck Circle to create the invitations. Each invitation had the Duck Circle, the circle charm, a pearl embellishment for the eye, a ribbon, and the details of the party on the back. I also used the Duck, Butterfly, and flower cut each one in 3 sets, attached to wooden sticks and made table displays using crystal bowls and baskets with foam and shredded paper. I also cut a Baby Shower & Circle, Butterfly, Rattle, and Duck in large sizes and used as wall decorations around the room. Here are some pictures I was able to find. 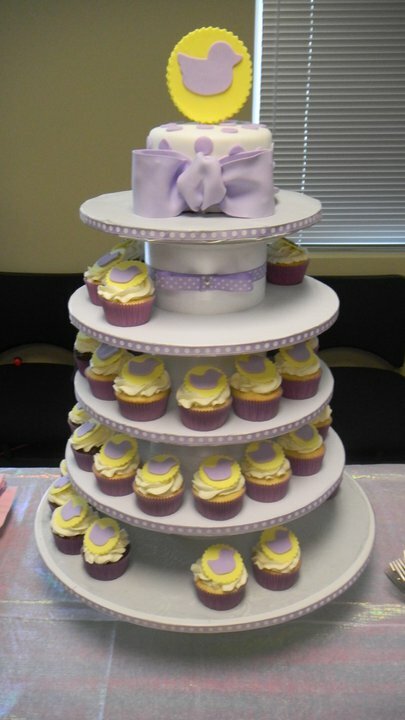 I do have to show a couple of photos of the AMAZING cake that my friends at Faboo Cakes made for the event. It was beautiful and delicious!! I use them for every event that I possibly can because their cakes are always amazing. Faboo Cakes is run by two absolutely lovely ladies. They are so talented. 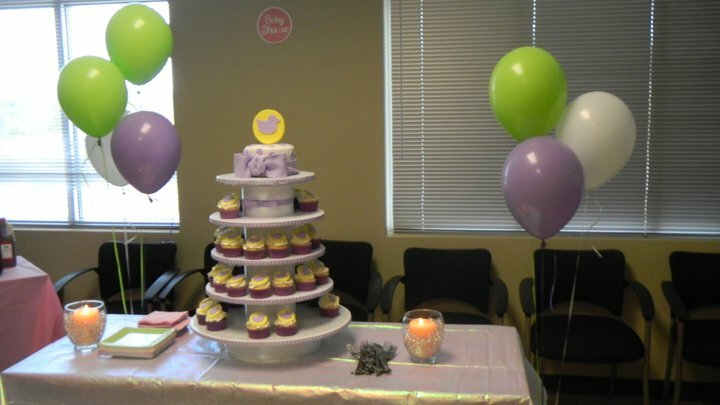 Stop by and check out their website – http://www.faboocakes.com . Faboo Cakes – best bakery around!! This entry was posted in Creative Stuff, Cricut - New Arrival, Cricut Cartridges, Paper Crafts and tagged baby, baby shower, cupcakes, decorations, duck, faboo cakes, new arrival by tiannafonz. Bookmark the permalink.